Artillery fire actually killed more men than machine guns, but statistics simply don’t convey the horror of European armies on the Western Front facing automatic fire. For example, during just one day in 1916 at the Battle of the Somme the British lost 21,000 men — many of them killed by Spandau machine guns, the German version of the Maxim. The French attempt in 1918 was called the Chauchat, named after chief designer Col. Louis Chauchat. The 8 x 51-millimeter Chauchat was portable — it weighed about 20 pounds — and had a detachable box magazine. It could fire in both semi-automatic and full-auto … and it was piece of crap. But by then, the United States had entered the Great War. That not only meant the influx of American manpower but also the nation’s industrial might and ingenuity — including the formidable abilities of John Moses Browning, the Thomas Edison of weapons design. 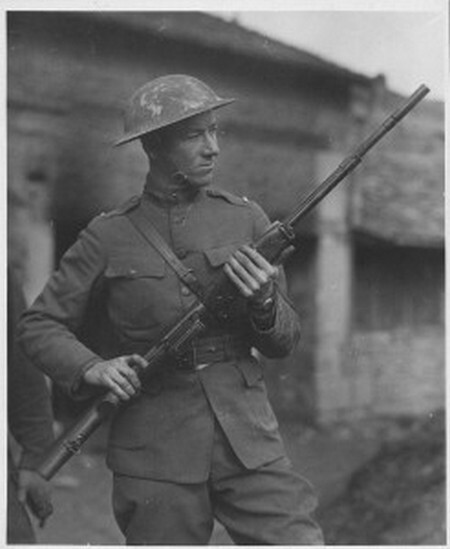 John Browning designed a light machine gun that fired the formidable .30–06 caliber round, the same ammunition used by U.S. soldiers in their M1903 Springfield bolt-action rifles. “Light” didn’t mean lightweight — the weapon with a loaded 20-round box magazine weighed more than 20 pounds — but compared to the Chauchat it was a godsend. Even today, there are serious efforts to bring back the BAR. The Heavy Counter Assault Rifle by Ohio Ordnance Works is a modernized version of the classic weapon. It has a 30-round magazine, adjustable Magpul buttstock, polymer pistol grip and Picatinny rails — and is chambered in .30–06 just like its venerable grandfather. The company hopes that the Pentagon will take a serious look at the HCAR. Their argument is a 21st century incarnation of the BAR with its .30–06 round has more stopping power than the 5.56 x 45-millimeter M249 squad automatic weapon or the 7.62 x 51-millimeter M14 battle rifle.